Here's an experience of mine that may help others. When I bought my second Jackson Kelly some 15 years ago or so, I decided to go with a much lower tuning than I was previously used to. The problem was that the much heavier string gauge I needed to use made the locknut screws almost too short. Almost. There was still a thread or two to lock it down, but that's asking for trouble. There is absolutely no need to tighten these nuts down so hard they flatten the strings. Just snug enough that they won't loosen by themselves, but even repeated "just snugging them down" over the course of several string changes will wear the available two thread turns into something useless. 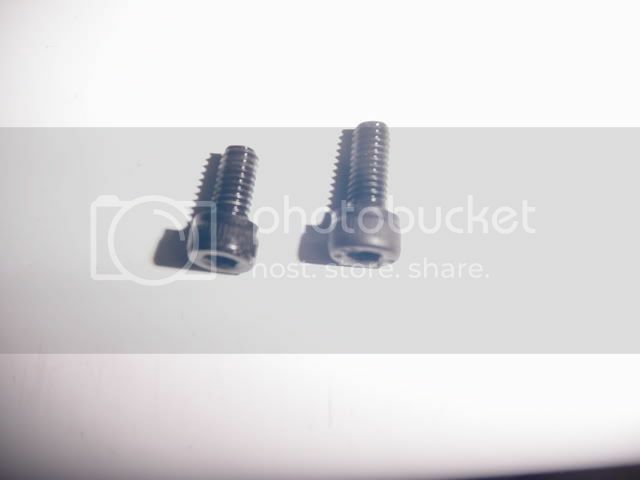 The trick (if you could call it that) is to take one of those screws down to a hardware store or fastener shop that you know will have a decent supply of the not-so-everyday-use fasteners. Find one of the exact same style head, diameter, and thread count but make sure it's just a bit longer in length. You don't want it get one that's so long it bottoms out and causes other problems. If I had used a segment of guitar string (which I should've) in this pic back when I took it, you would definitely see that the string thickness will affect how much of that locknut screw is or isn't actually getting a good thread engagement. It wasn't so much a problem with lighter 42-46 strings, but 52 made it obvious that the screw and locknut base wasn't going to last for very long. And I only needed one new length screw for each guitar instead of replacing all three because the other 4 higher thinner gauged strings already worked out fine....just the lowest 2 heavy gauge strings needed the little extra peace of mind. Of course, there's a lot of differences that may or may not require this "mod". Some guitars might already have an optimal screw length on their locknuts, some may not. But if yours doesn't, this is probably the easiest guitar modification you'll ever do. Re: Heavier strings and Locknut? Just curious Kim if you are tapping the nut shelf slightly deeper to accommodate this little extra length of the hex screw? I had no need to do anything else to accomodate the longer screw for my applications. The screws on my guitars didn't go all the way down through the baseplate holes anyway. Ideally, one would simply only need to add the string thickness difference to the length of the screw, but you'll only find screws in standardized lengths. Example: Changing the string from .042 to .056 is a difference of .014 so finding a screw .014" longer should do the trick, right? Well, good luck with that; you'd just have to compromise and get whatever the next standard size bigger is and try it out. Most cases will not need any further modification, but as always....YMMV. Or you could make the right size screw by cutting a bigger one shorter? OK I see what you are saying now Kim, glad that works then! That's what I would have done. 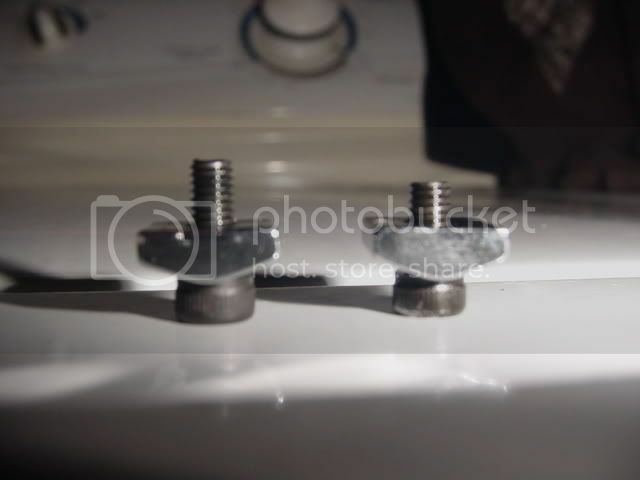 Just get slightly longer screws and take them to a bench grinder to bring them down to size, then taper the ends and run them through a die to chase the threads at the start and clean them up. I would get the screws from a machine shop though instead of a hardware store. I don't have too much affinity for Chinese fasteners since they are made of inferior alloys, and in some cases what we call "pig-metal." I prefer hardened steel for a more solid connection and better vibration transfer. I use a special cutter tool to cut the small size screws. I can go up to M6 (6mm) with mine. Also, try using D'Addario half-rounds on the low string; the slightly fatter core increase tension by some 8-12% IIRC. Sounds pretty much like ordinary XL's. Or try Kalium strings.